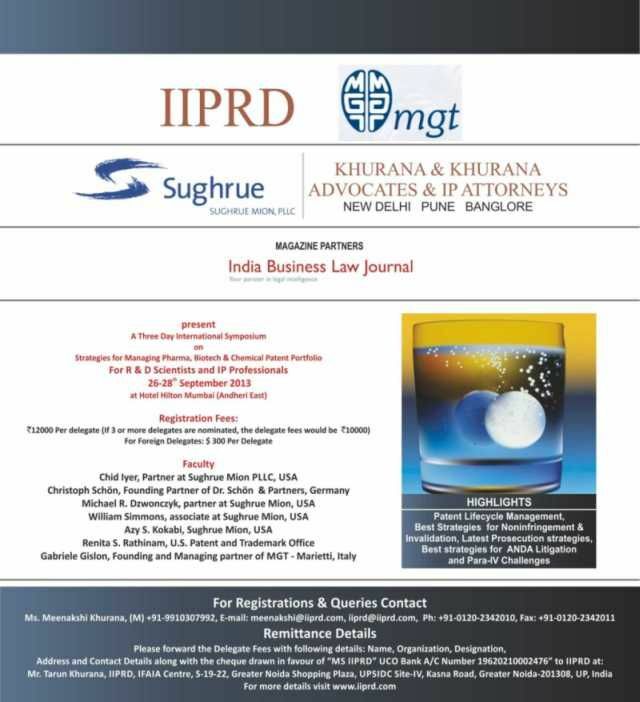 We are happy to inform you all that IIPRD and Khurana & Khurana, in association with Sughrue Mion (US), Schoen & Partners (EP), and Marietti Gislon S.R.L are holding their annual International Patent Symposium covering all major and relevant Pharmaceutical/Biotechnology Related Patent issues in the month of September, 2013 in India. The Three-Days International Symposium would be covering Strategies for Managing Pharma, Biotech & Chemical Patent Portfolios in US and EP and is being held from 26’th-28’th September 2013 at Hotel Hilton, Mumbai. Please see the complete details including Program Schedule, Topics, Speakers Profiles etc. in a brochure available over here. If you wish to attend the symposium, please send your nominations to iiprd@iiprd.com. Follow us on Twitter: @KnKIPLaw.